Celebrate your appreciation for your favorite dog breed or pet this holiday season by sending dog breed Christmas cards to the friends and family members on your list. When selecting a holiday greeting card, it's important to select a design that makes a statement about who you are. If you are a dog lover, sending Christmas cards with images of your pet or of your favorite type of canine can be great way to interject a bit of personality into your annual holiday greeting message. As soon as you decide that you'd like to send dog breed cards this season, start shopping. This is a popular theme for holiday cards. By shopping early, you'll ensure access to the best selection of designs and breed options. Many merchants carry holiday cards with images of popular dog breeds. There's a good chance that your favorite pet store carries several varieties of Christmas cards with canine images. You may also find them at stationery stores, mass merchandisers, office supply stores and small gift boutiques. Artists who specialize in animal art often create entire lines of products with prints of their favorite images. If you enjoy visiting craft shows throughout the year, keep your eye open for greeting cards and other types of stationery with images of your favorite breeds of dogs. Dog show vendors may be another source for all breed Christmas cards. If you want to show off your own beloved pooch on your holiday greeting cards, you can have them made using your own photos. You can use your own snapshots, or you can have a photographer take holiday photos of your canine companion for the purpose of creating custom Christmas cards. Many photographers specialize in pet photography, providing both in-studio and at-home candid shots of family pets. Once you have a good picture of your dog, you can easily convert it to a greeting card. Many print shops and office supply stores offer custom card making services. Check with your local Office Depot, Kinko's or AIM Mail Center for prices on creating a holiday card using your own dog breed photo. You can also create do-it-yourself cards using desktop publishing software or an online service such as Zazzle. 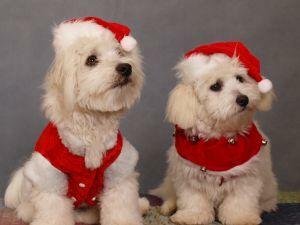 Visit LTK's Christmas dog slideshow for some greeting card inspiration. It's also possible to create greeting cards based on a portrait of your dog. Many people have pet portraits made. If this is something you have done or are interested in doing, ask the artist for a digital image of the portrait that you can use to create your own greeting cards or other items featuring the image of your pet. You can do the same with a drawing of your favorite dog breed. If you have artistic skill, you can make your own drawing or your can commission one from a local artist. With a digital image of the drawing, you can create cards using the same techniques as making cards from a photograph. Sending dog breed Christmas cards is a terrific way to send holiday greetings while sharing your appreciation for your favorite breed of dog. Everyone on your holiday list is sure to be delighted when your canine Christmas card arrives in the mail.